Homily delivered by Fr Fachtna O’Driscoll, SMA Provincial Leader, at the concelebrated Requiem Mass for Fr Paddy Whelan at St Joseph’s SMA Parish Church, Wilton, Cork at 12 noon on Monday, 13 February 2012. 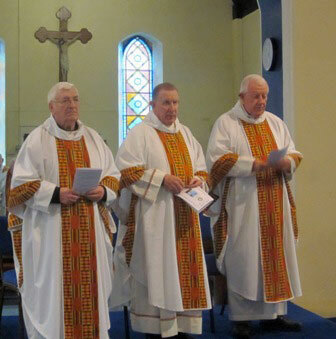 The principal concelebrants were two classmates of Fr Paddy: Frs Vincent Lawless and Mattie O’Connell (home on leave from Ondo diocese, Nigeria) and the SMA Claregalway community Leader, Fr Seamus Nohilly SMA. “We try to equalise before the other team have scored”. This humorous quip, attributed to the late soccer legend Danny Blanchflower, somehow comes to mind when I think of Paddy Whelan. Many of us recall with a smile Paddy’s ability to replay a football match or a round of golf with an uncanny and almost photographic attention to detail. Today we celebrate this aspect of Paddy’s personality just as we celebrate all aspects of his character. 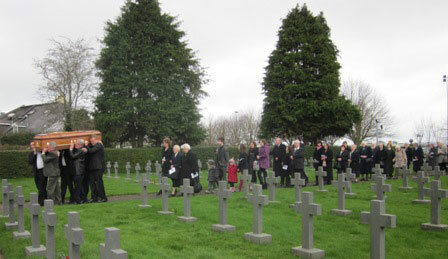 And we celebrate his life in the context of our faith assertion that Paddy’s life has changed but is not ended. He took his final gulp of air, surrounded by family and SMA colleagues, early on Friday morning, and so moved into a new stage of being. We believe he continues to live in God’s presence but in a new way. Every funeral presents us with an opportunity to reflect on the true core matters of our faith. 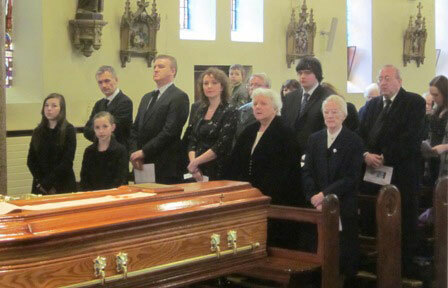 Paddy’s funeral is an occasion to give praise and thanks to God for God’s infinite goodness and eternal fidelity. This is brought out very clearly in all our readings this afternoon. The first, from the Prophet Isaiah, using the theme of life-giving water to represent the very life of God that we are invited to share, speaks only of receiving this life. Again and again the scriptures remind us that salvation is not something we can either earn or buy. It is a totally free gift of God and our only task is to receive it. Using the metaphor of trading, the prophet tells us that we don’t need any money to receive the gift that God is offering. That is to say, salvation is ultimately not so much about our response but rather about God’s incredible generosity. He has made an everlasting covenant with his people. That covenant was ratified and sealed by Christ’s death on Calvary and guaranteed by his resurrection on the third day. That is why a funeral for a Christian is not so much a moment of sadness as it is a moment of celebration. The prophet goes on to turn on their head our normal categories of judgement. “For my thoughts are not your thoughts, my ways are not your ways – it is the Lord who speaks. Yes, the heavens are as high above earth as my ways are above your ways, my thoughts above your thoughts”. There is a great consolation in that for all of us: which one of us would want to stand before our neighbour and make their judgement the final arbiter of our salvation. Our second reading from the First Letter of St Peter focuses on the theme of resurrection in a very direct way. St Peter tells us that “God the Father of our Lord Jesus Christ has, in his great mercy, given us new birth as his children, by raising Jesus Christ from the dead, so that we have a sure hope and the promise of an inheritance that can never be spoilt or soiled and never fade away”. St Peter is in no way tentative about the proclamation of this faith position. We have a sure hope and the promise of an inheritance that will never fade away. This is a powerful expression of the Christian position. At death, then, we are not faced with doubt as to the future but rather with a conviction that through the resurrection of Jesus Christ we too will rise from the dead. That is the faith we profess. That was the faith that Paddy Whelan lived and taught all his priestly life. We take comfort in that faith today as we come to bury his mortal remains. Paddy was born one month short of eighty years ago in Sylane, Belclare, in the parish of Corofin, Co Galway. He took a very healthy pride in his county all through his life and rejoiced especially at Galway’s many victories on the GAA fields. He attended local primary school after which he went to the SMA secondary school at Ballinafad. Here his interest in all sports was fostered. Here too he developed his interest in missionary work and took the usual journey through studies with the SMA, being ordained to the priesthood in 1956. After ordination Paddy was sent to UCC to take a science degree. During these years in UCC he was a member of the Sigerson Cup football team which he served with great distinction. He also played for his home team in Corofin. His sports interest was not confined to Gaelic games, however, as it was really universal in scope. He took a keen interest in golf and was an equally keen fisherman. He collected stamps and took a great interest in birds, whom he fed each morning at Claregalway right up to his recent bout of illness. Having graduated from UCC, it was no surprise that Paddy would spend much of his missionary career in education. He taught at both Aquinas College and Sacred Heart Minor seminary, in Akure in the diocese of Ondo, Nigeria. These periods were separated by a short stint back at Ballinafad, as director of students. He also spent some time at Stella Maris College, Okitipupa, Nigeria. Having given the guts of forty years in the teaching profession, he spent his final years in Africa in pastoral ministry in Ondo, Ore and at St Leo’s, Ibadan. Ill health was to require his move away from the tropics but this did not mean he could no longer contribute to the missionary work of the SMA. He was to spend the past eleven years as bursar of SMA House, Claregalway. Here he was meticulous in his attention to task. This home appointment also allowed him to cement old friendships and build new ones with his neighbours around his home place. He enjoyed his regular game of golf and supported his favourite teams up and down the country. But Paddy was first and foremost a priest. He celebrated countless Masses for various communities in over fifty six years of dedicated priestly service. How often did he share the Body and Blood of Christ with these communities. “I am the living bread which has come down from heaven. Anyone who eats this bread will live forever; and the bread that I shall give is my flesh, for the life of the world”. The beautiful gospel reading from John 6 – the great tract on the Eucharist – is well chosen because Paddy had a profound faith in and devotion to the Eucharist. I suppose there was hardly a day in his life since he joined the SMA that he did not receive the Body of Christ. And he made it possible for others to share in the same Body of Christ. It is fitting, then, that it is by this same Eucharistic celebration that we say our last farewells. Paddy will be sadly missed by so many; his family, his former pupils and parishioners in Nigeria, his colleagues in the SMA, his golf partners and fishing buddies and the staff and visitors to SMA House, Claregalway where he was a much admired and loved priest. But we take consolation that his time of suffering has now ended. His final years were marked by occasional bouts of acute illness. We thank God that his final days were marked by contentment and serenity and by a willingness and desire to move home to the God he strove to love and serve faithfully throughout his life. Ar dheis lámh Dé go raibh a anam dilis.